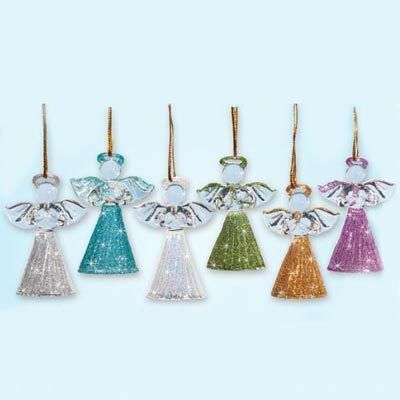 Delicate Handblown Glass Angel Ornaments, each one features a glittery skirt, and glitter accents on the wings and halo. Each includes a 2"l gold cord for hanging. Set of 6. Imported. 2½"h.
I look for a simple gift to give to my 6 sister-in-laws for Christmas each year. These are perfect! The colors are as shown in the picture, wish one was red, but...ok. They are well secured in the package they come in. Well worth the reasonable price!